The most dramatic changes mandated by the Affordable Care Act, aka "Obamacare," kick in by 2014. These companies are poised for big growth as they work with hospitals, insurance providers and others scrambling to hit deadlines. Sanjay Singh has always been a CSPAN junkie. In 2009, he followed the health care reform debate so closely, he listened to the law's markup sessions in Congress. 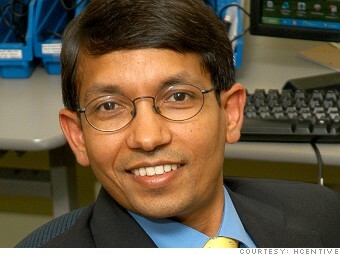 At the time, Singh and his partners were running GlobalLogic, a software development outsourcing company they founded. Singh redirected their attention to heath care. The three launched hCentive, a technology firm that built a platform on top of which health insurance exchanges can operate. That's a fiendishly complex task. Insurance companies need to connect to various state and private exchanges, and consumers need to be able to easily shop there. The state exchanges are supposed to all be up and running by Oct. 1, 2013. After the election, a big cloud of uncertainty lifted, Singh says. Inquiries from potential customers picked up significantly. "Many states were waiting to decide to set up their own exchanges -- they kept thinking maybe this wouldn't happen," Singh says. "Now they are so late, many of them won't meet the deadline and will use a [federally operated exchange] as an interim approach." Ten health plans, both national and regional, are in the process of signing on to use its hCentive's solution to connect to state and federal exchanges.